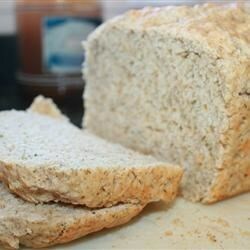 "Beer Bread is a quick bread to make to accompany any beef dish. The type of beer you use will change the taste." Bake at 350 degrees F (175 degrees ) for 50 for 60 minutes. The top will be crunchy, and the insides will be soft. Serve topped with butter or cheese spread. Excellent! I let mine sit for 30-60 min before baking (while in the pan). The tips to make your own self-rising flour are so helpful, works great.